Vacation Pet Friendly is all about travel and making sure you and your pet have a fabulous vacation. While we have our share of pet friendly hotels, sometimes it’s nice to take a break and head out for the great outdoors. It’s hard to beat sitting around a campfire, enjoying panoramic views and exploring new trails and breathing in fresh air. 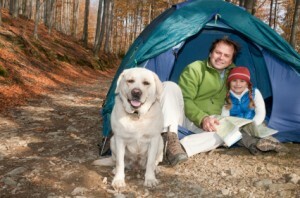 With some planning and thought, it’s easy to ensure an adventure of pet friendly camping. Vacation Pet Friendly has listings for tent and RV campgrounds throughout the U.S. Simply plug in the city name in the Plan Pet Friendly Trips search box and you will find nearby campgrounds. If you have never traveled with a dog or cat before, you also may want to read up on some of our articles, such as Traveling with a Dog. Before you head to the woods, there are things you will want to check on. First, you will want to make sure that the camping site allows pets. You’ll also need to find out whether or not leashed pets are allowed on the hiking trails. Whether you’re planning on pitching a tent or camping in an RV, always have your pets sleep inside with you for protection from night animals like coyotes, raccoons, bears and snakes. You can bring your pet’s bed from home for a cozy slumber in an RV. For tent camping, be sure to place a tarp or thick blanket underneath your pet’s bed to prevent the cold air from the ground from chilling your pet. One of the most enjoyable things about camping is it is conducive to relaxing. Bring along a camping hammock or jumbo hammock chair…especially if you are taking an RV. They are portable and can be hung from most trees. There is nothing better than stretching out in a hammock of some sort with your pet and watching the sunset from a hammock chair. We found some really great ones at Beachside Hammocks. Finding great hikes, places to swim and good campsites are pertinent to making your camping trip fun and relaxing. These are things you can plan before you go. Our website has all the information on this along with maps. If you are going out for any real length of time, you will most likely want to stop and stay at a pet friendly hotel once in a while to freshen up. We have many that don’t require making reservations too long in advance. In fact, many you reserve from your mobile devise. While hiking with your pet, it’s important to avoid wild mushrooms, acorns, elderberries and poison ivy. These natural items can be poisonous to dogs. It is also best not to let your pet drink from natural water sources, unless you have iodine purification tablets or a water-filtration system. Giardia and cryptosporidium are common parasites in natural water sources and can cause severe cramping and diarrhea. National forests are ideal for camping with your pet, but state parks are a different story. Some allow pets, and others do not. National camping resort chains like Jellystone and KOA are pet friendly. Whatever pet friendly campground you select, it is sure to be extra fun for your pet. Be sure to take your pet along with you for some picturesque hikes and cooling swims while you enjoy the great outdoors.